Light, attractive and stable, circular drying rails of hardened aluminium. No dangerous rods sticking out. A complete set for each size of tent includes drying rail and suspension straps. You can easily add a second rail. . Available for each size of tent, specify size 5, 7, 9, or 15. Drying rails are invaluable for drying clothes, hats & gloves, and much more. 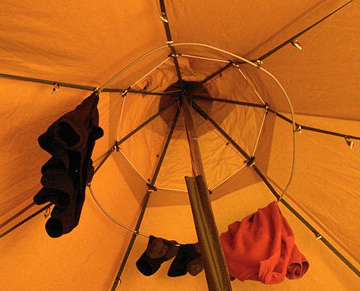 When ventilation options are closed, a tipi's natural shape collects and concentrates heat near the very top providing an natural, safe, and ideal place for drying your things. Drying rail sets are made of hardened lightweight aluminum tubing. They're light, attractive, stable, and strong. Circular shape ensures there are no dangerous points sticking out. They're also optional. Bring them along in winter or when wet weather is probable. Drying rail sets break down quickly and easily for packing and transport. Click the button below to add the Tent Drying Rail Set - 5 to your wish list.